Take up the battle in a world beset with magic and evil like never before! The iconic heroes of the Pathfinder world burst onto your tabletop with this set of 6 gaming figures for use with the Pathfinder Roleplaying Game! or the Pathfinder Adventure Card Game! Each figure is an ALL NEW sculpt featuring a dynamic pose, incredible detail, and a premium paint job. 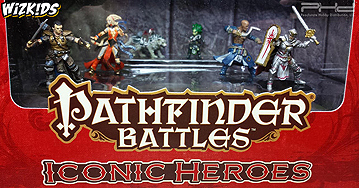 Complete the entire Pathfinder Battles Iconic Heroes collection of more than 30 adventurers from every single Pathfinder character class! As a gnome druid, Lini has always had an affinity for the forest and its creatures, and meticulously collects sticks from each new patch of woods she visits. While her companions often find her mannerisms a bit odd, Lini knows that the natural world itself understands her, as proved by Droogami, her snow leopard companion. Droogami was an ordinary snow leopard until the day a mysterious nature spirit introduced the animal to a young gnome named Lini. For the first time in Droogami's life, a humanoid spoke in a language the snow leopard could understand, and the cat saw the strange, tiny creature not as a threat or prey, but as a friend. The two have been inseparable ever since. After gnoll raiders killed her parents, a young Seelah stole what she needed to survive. But when stealing the helm of a paladin caused that brave woman to die defending the town from another gnoll attack, Seelah's guilt led her to swear herself to the goddess of justice, determined to protect the innocent. After escaping his father's farm, Valeros determined to make his own way in the world. After years as a mercenary, he got tired of taking orders, and decided the freewheeling life of an adventurer was far superior. Crass but noble, Valeros is fiercely loyal to hid friends, and loves nothing more than an evening of "hard drinking and soft company". Seoni is a native Varisian, and grew up in a caravan constantly travelling from city to city. Both her tattoos and the sigils on her clothing mark her as a person of great status and magical power, and she uses these traits and her natural penchant for planning and organisation to lead her adventuring parties to wealth and glory. Sajan and his twin sister Sajini were raised from birth to be warrior monks. When their lord lost a battle, however, Sajini and other warriors were given to the victor as tribute. Sajan deserted his post in order to follow, only to find that she'd already been sent to parts unknown. Sajan now travels the world searching for his sister.